Lenovo design idea System R & D team, high quality, reliable. Built-in active amplifier products, pure sound beautiful. 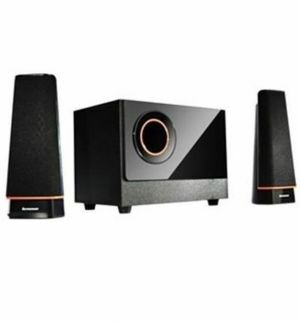 Integrated subwoofer and 2.1 surround sound, provide dynamic sound. Wood speaker panel with bright, dignified and stable, with a full quality. Idea family of products, a touch of shiny black body above the orange outline fine lines, this series and Lenovo computers seamless design idea do now fashion charm.